GE Refrigerator or Freezer too Warm? - You Can Fix It! If your GE refrigerator or freezer is suddenly warmer than it should be then you likely have an issue with the main controller board. The controller board is the brain of the entire refrigerator so if the refrigerator or freezer is too warm then it is likely an issue with the main controller board. Buttons don’t work on the water dispenser? 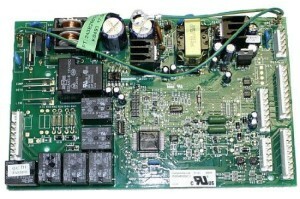 Likely the main controller board. The lights work but nothing else? You guessed it. I know, it sounds scary but it isn’t really that bad. Fortunately, you can pick up a new main controller board from Amazon for around $130 and replace them yourself by just following the simple instructions or some youtube videos. This will likely fix your GE refrigerator cooling issues. Take your time replacing this controller board and your fridge will be cooling as good as new! Let us know if this worked for you (or not) in the comments below so we can help each other fix these annoying problems! Try this one. Freezer is ok. Fridge not colder then 40 degrees. Replaced mother board, all 3 Thermister, thermostat, defrost heater,control in fridge to make hotter or colder. 3 tech has been out. Says everything test fine. What is your best guess. Model Gss20iemdcc. GE refrigerator model #DSHS5PGXAESS, compressor running, condenser fan running and coils clean. Both freezer and fridge side not cooling. We have a GE model# gdssokcxarss and the refrigerator and freezer are not cooling, I’ve turned off the unit, waited a few minutes and plugged it back in. We heard the fan and the compressor kick in but after a few seconds you just hear the fan and nothing else. We have vacuumed the area of the fan and other places but to no avail.